This time of year I go crazy for sweet vibrant blood oranges. They bring a ray of sunshine into a season of dreary fruit. 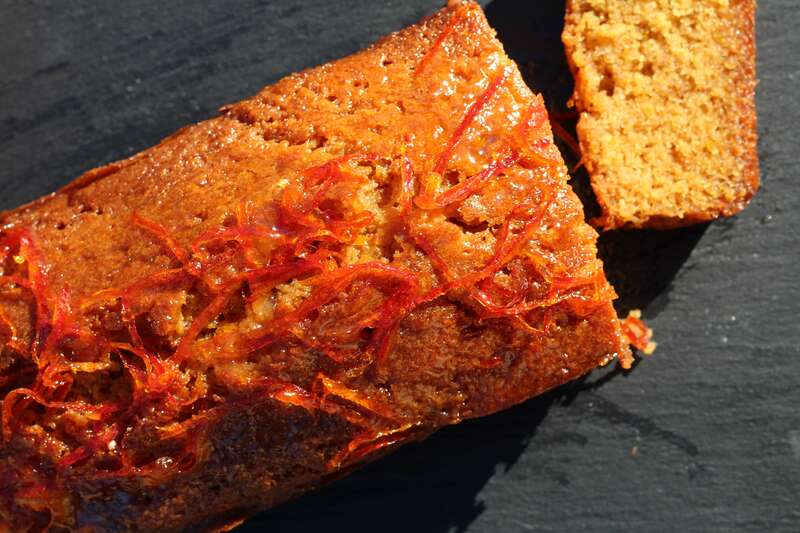 So what better way to use the oranges than in a drizzle cake. Perfect for a lazy Sunday afternoon with a cuppa after a bracing dog walk with Chester our Cockerpoo. It is super simple to make and the kids can join in too. The sponge is basically a Victoria sandwich recipe, but when filled with the zest and a little juice of the oranges, it is transformed into a citrus delight. Then it is crowned with a sweet zesty orange syrup that oozes into the cake to make it super moist. OK I am dribbling, I need to go and grab a slice. Grease and line a 2lb loaf tin with baking parchment. Preheat the oven to 180˚C (160c Fan), Gas 4. In a stand mixer or with an electric hand whisk, cream the butter, brown sugar and zest of 2 oranges until light and fluffy. Scrape down the sides of the bowl and add the eggs one at a time. If it starts to curdle, add a couple of tablespoons of flour. Add the remaining flour and baking powder, a tablespoon of the juice of one of the oranges (and orange extract if using) and mix until combined. Pour into the lined loaf tin and bake for 45-55 minutes. Poke a skewer into the middle of the cake and if it comes out clean it is done. Whilst the cake is in the oven, put the caster sugar in a small pan with about 6 tablespoons of orange juice and the zest of the remaining orange and simmer until the sugar has dissolved. When the cake comes out of the oven, pierce the top all over with a skewer. Then pour on the orange syrup you have made. Leave to cool completely in the tin before removing. 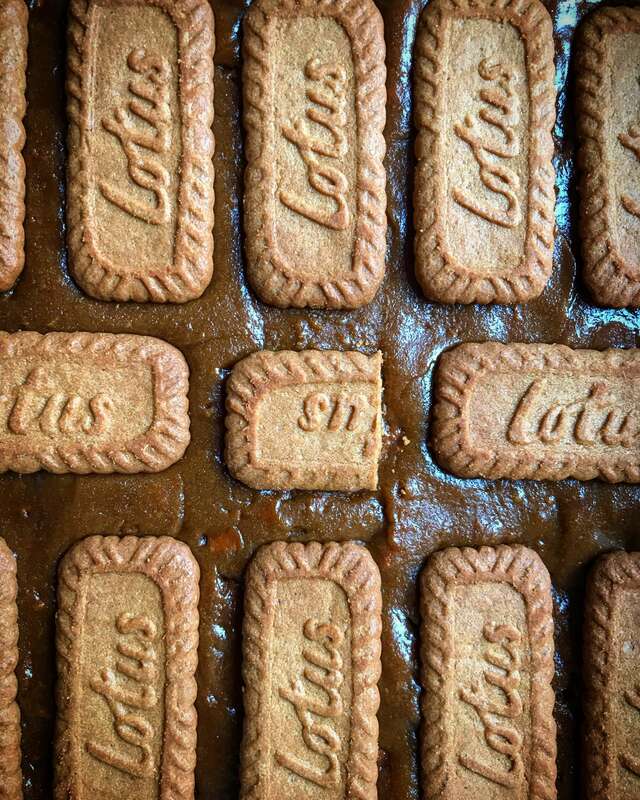 My boys absolutely love Lotus Biscoff biscuits. If we were ever out for a meal and I had an espresso and these biscuits were served on the side , I would not get a look in. Then Pizza Express started doing a Biscoff cheesecake and my biscuits were safe as my youngest would want his own cheese cake desert. That got me thinking as to what I could make that was based on these biscuits. It needed to be quick and easy to get the kids involved. I landed on the blondie as the vehicle to carry the delicious biscoff caramel flavour. Blondies are even easier to make than brownies. Just melt the butter, sugar, spread and vanilla together. Let it cool a bit. Mix in an egg, flour and some crushed biscuits and you are pretty much done. 10 minutes to make, which even my kids can pay attention for and then 20 minutes baking. Job done. After the kids gave them the thumbs up, I took a batch into the office for some more discerning feedback and they were a resounding success. They have become one of the top 3 bakes I have taken into the office in their mental score sheet. Pre-heat oven to 180c (160c) Fan and line a square 9 inch baking tin with baking parchment. Melt the butter gently in a saucepan along with the dark brown sugar, salt, Biscoff biscuit spread and vanilla extract until all melted and combined together. Allow to cool for 5 minutes and then whisk in the egg. Add the flour to the wet ingredients and fold in gently until combined. Crush 8 biscuits and gently fold into the mixture. Spread the mixture evenly into the tin, then place the remaining biscuits on top. Bake for 20-25 minutes until golden on top but still a little squidgy in the middle. Leave to cool in the tin for 30 minutes. Then remove and cut into rectangles around the biscuits. My boys absolutely love Lotus Biscoff biscuits. 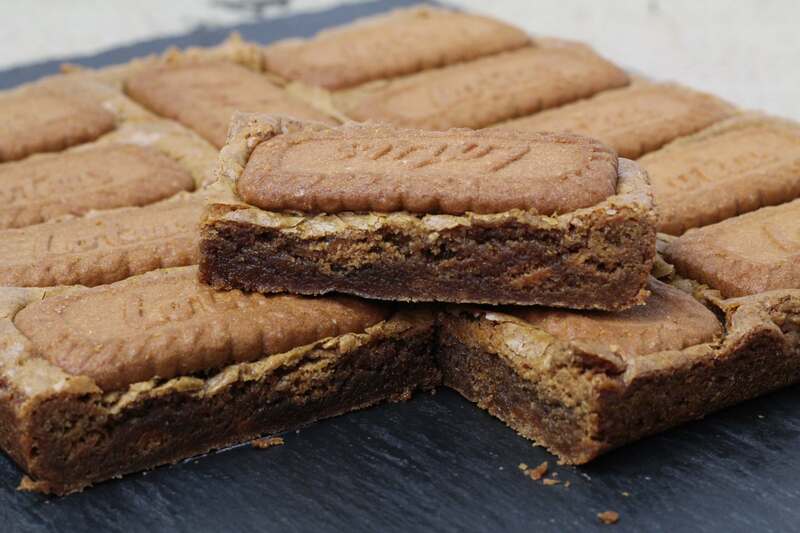 These delicious, gooey, caramel, biscuity blondies were a resounding success with the kids and become one of the top 3 bakes I have taken into the office. So easy to make and get the kids involved.